田昌凤, 车轩, 刘兴国, 周寅, 王健. 池塘养殖沉积物收集装置的研制[J]. 上海海洋大学学报, 2019, 28(1): 103-108. TIAN Changfeng, CHE Xuan, LIU Xingguo, ZHOU Yin, WANG Jian. 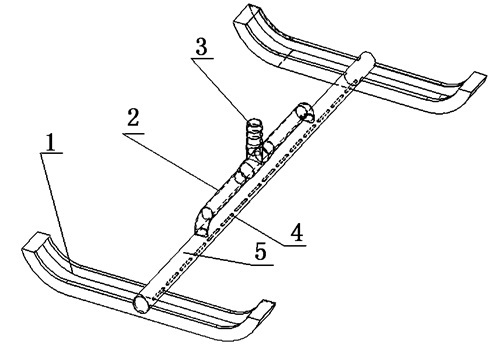 Design of sediment collection device for pond culture[J]. Journal of Shanghai Ocean University, 2019, 28(1): 103-108. 张杨宗, 谭玉钧, 欧阳海. 中国池塘养鱼学[M]. 北京: 科学出版社, 1989. ZHANG Y Z, TAN Y J, OUYANG H. Chinese pond culture[M]. Beijing: Science Press, 1989. 刘焕亮, 黄樟翰. 中国水产养殖学[M]. 北京: 科学出版社, 2008. LIU H L, HUANG Z H. Aquaculture in China[M]. Beijing: Science Press, 2008. 刘兴国, 刘兆普, 徐皓, 等. 生态工程化循环水池塘养殖系统[J]. 农业工程学报, 2010, 26(11): 237-243. YORAM A, GAD R. Shrimp and fish pond soil:process and management[J]. Aquaculture, 2003, 220(1/4): 549-567. YUAN Y. Moving Character and the Chemical Effects in Dike-Pond System of Nitrogen and Phosphorus in Culture Water[D]. Guangzhou: SunYat-SenYniversity, 2006. 王彦波, 许梓荣, 郭笔龙. 池塘底质恶化的危害与修复[J]. 饲料工业杂志, 2005(4): 47-49. WANG Y B, XU Z R, GUO B L. Harm and repair of pond bottom deterioration[J]. Feed Industry, 2005(4): 47-49. 佐藤善德, 刘静. 底质的有机污染及其改良方法[J]. 河北渔业, 1990(2): 25-28. ZUOTENGSHANDE, LIU J. Organic pollution of substrate and its improvement methods[J]. Hebei Fisheries, 1990(2): 25-28. 张金宗. 浅谈池塘淤泥过多对养鱼的危害及化解办法[J]. 渔业致富指南, 2003(2): 31-32. ZHANG J Z. Harms and solving method of pond silt to fish farming[J]. Fishery Guide to be Rich, 2003(2): 31-32. 苗爽, 陈婷婷. 底泥碳氮磷的研究现状[J]. 吉林农业科学, 2011, 36(1): 17-28. 蔡惠凤, 陆开宏, 金春华, 等. 养殖池塘污染底泥生物修复的室内比较实验[J]. 中国水产科学, 2006(1): 140-145. 彭国祥. 池塘底泥的改造[J]. 渔业致富指南, 2010(4): 69-70. PENG G X. Transformation of the pond sediment[J]. Fishery Guide to be Rich, 2010(4): 69-70. 田功太, 刘飞, 段登, 等. EM菌对海参养殖水体主要污染物净化效果的研究[J]. 山东农业大学学报(自然科学版), 2012(3): 29-31. TIAN G T, LIU F, DUAN D, et al. Effect of EM on purification of major water pollutants in farming sea cucumber[J]. Journal of Shandong Agricultural University(Natural Science), 2012(3): 29-31. 田丽粉, 周勇, 刘桂明. 池塘养殖清塘消毒常用方法[J]. 渔业致富指南, 2012(2): 29-31. TIAN L F, ZHOU Y, LIU G M. The method of the pond farming clear and disinfection[J]. Fishery Guide to be Rich, 2012(2): 29-31. 刘兴国, 徐皓, 张拥军, 等. 池塘移动式太阳能水质调控机研制与试验[J]. 农业工程学报, 2014, 30(19): 1-10. 郭关柱. 新型轨道吸污装置吸污能力研究[J]. 中国铁道科学, 2012(2): 76-81. Abstract: In order to solve the problem of concentrated collection of pond sediment, a sediment collection device was designed. It mainly consisted of suction device, travelling mechanism, control system and floating pipeline. The suction device can lift the sediment to the bank by the sewage pump. 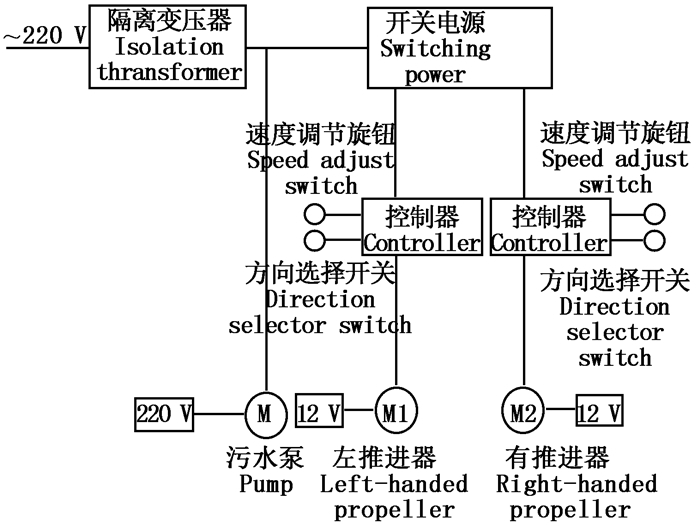 The DC propeller of travelling mechanism provided power. The control system controlled the working state of the sewage pump and the two propellers to achieve normal operation of the device. Results of a series of tests on the mechanical properties revealed:The speed should be controlled within 0.1 m/s in working operation; Staying between 20-40 s, the fixed point of sediment can be completely sucked; The capacity of sewage suction was 0-14 m3/h; The mud content was 0-12.7 m3/h; The sediment concentration was 0-35%; The power of machine supporting was 0.9 kW; The idle running noise was 52 dB; the transmission distance was 100 m. The sediment device for pond culture used 220 V AC power is the power source. The power is isolated from the power grid by an isolation transformer, and then sent to the control platform of the sediment device for pond culture. It is high safety. The machine has the characteristic of large working area, which is conducive to the collection of pond culture sediment.